Sunny beachhouse, centre bay with an Island opposite. Flat section, large lawn area reaching down to the clear waters of a safe swimming beach. 20 mins North East of Whangarei and 2.5 hours from Auckland. Relax on the deck while you watch the water action. Open plan kitchen and lounge with the usual facilities. Dairy and restaurants are 5 mins down the road or just a short boat row away. A row boat, two kayaks and life jackets provided. Surf beaches 10 mins away. 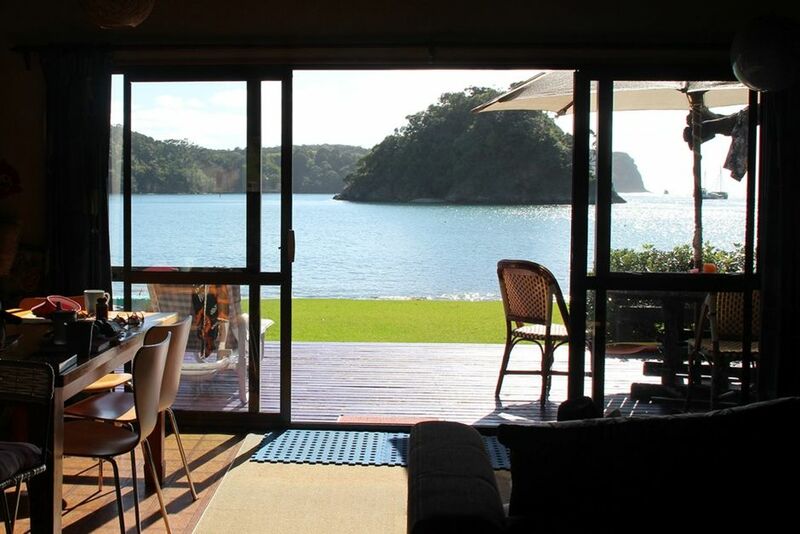 Spectacular views of the harbour and surrounding anchorage of the Tutukaka inlet. Fenced from the road. Plenty of room for trailers and boats to park and the lawn never gets muddy. Space for an extra tent or two with waterfront views. Soak it up! Four night minimum stay during high season and two day minimum in low season, some linen available but suggest bringing your own sheets, pillow cases and towels as there is no dryer if it rains on the day you leave. Please smoke outside. Pets by negotiation. Note: If more than 6 persons want to stay then a $15 per head per night tariff will be applied. eg. 2 couples inside and 1 couple in a tent – plus children. Extras: Service fee: $30. Plus optional cleaning fee depending on the length of your stay, or you clean yourself to the expected standard. Averages around $60. NOTE: Under Kiwi bach tradition you are expected to: Bring your own linen (towels/sheets/tea towels). View of entire bay and island from sunny central beach location. One bathroom with shower and toilet. No bath. Absolute beach front on a calm safe beach with an island out the front. Great for young children to become confident swimmers. Parking for several cars. Lawn is good to drive on all year round. Campervans by negotiation – seaviews provided. Double doored Fridge freezer side by side. Plenty of storage. Salt, pepper, cooking oil, tea bags, sugar, herbs and spices. Full kitchen with pantry, breakfast bench and microwave. Sandwich maker and small applicance griller also available to use. Dining table has setting for approximately 6 people. There is also an outdoor dining table with seating for 4-6 and an umbrella. DVD player. A selection of DVDs for your entertainment. A small library of books to swap out. A selection of DVDs for your entertainment. MP3 ipod cord attached to stereo. Big lawn out front and back. 2 Kayaks and one row boat with life jackets provided. Deck out front facing the sea. Sorry but we have stairs up to the house which would make it difficult for a wheelchair. From the moment we arrived Tracey's bach felt homely and welcoming with all the lovely little touches and artistic flair.It was spotlessly clean and provided everything you could possibly need. Nice full sized fridge and full sized freezer for all our provisions. The location is idyllic and perfect for the few days 'wind down' we needed. It was fun paddling the kayaks down to the marina having a coffee/tea and browsing the shops .Shopkeepers very obliging in providing plastic and even ziplocked bags for the return trip! !Keeping to the left at the marina away from the big boats takes you to a little beach ideal for pulling up the kayaks and it was only a very short walk to the shops. Lovely safe swimming and we loved the tranquillity and the sound of the surf to wake up to in the morning being so close to the water. My ideal holiday! Thank you for a great stay. We'll be back. It is a awesome place in front of the beach!!! What a gorgeous location! Lovely little bach. Comfortable and easy to be in. We loved it. Thank you! We absolutely loved our weekend in this lovely little bach! We absolutely loved our weekend in this lovely little bach! A beautiful little secluded spot with friendly neighbours and amazing beaches. Tracey was a pleasure to deal with, correspondence was efficient and everything was just generally well organised.